The 100 Acre Wood, also written as the Hundred Acre Wood, is an optional world based on the fictional locale of author A. A. Milne and Disney's twenty-second animated feature, The Many Adventures of Winnie the Pooh. It is special in Kingdom Hearts, Kingdom Hearts II & Kingdom Hearts III as a world within a world, because it is entered through an old book in Traverse Town, Hollow Bastion/Radiant Garden, and Twilight Town respectively. The world is contained within a magical book that Merlin keeps with him, and as Sora collects Torn Pages, the lost areas of the world are revealed as the story is retold. When Sora enters the book, he lands on a version of the flat map of the 100 Acre Wood. Classic locations such as Winnie the Pooh and Piglet's House are accessible, as well as the Muddy Path and Spooky Cave, making this world one of very few to show a change of day. Each location usually harbors a mini-game with prizes which help Sora, Donald, and Goofy on their journey, although Sora is the only one that goes into this world. It is doubtful there is a ruler of this world. Strangely, throughout the entire series so far, not one Heartless has appeared in this world. Because of this downplay of violence, Sora's "Attack" command is changed to "Hit" while in this world. In Kingdom Hearts Birth by Sleep, the 100 Acre Wood is a world that is only available for play through the Command Board, rather than a complete world. In Kingdom Hearts III, the world returns and features mini-games. The Keyhole for this world is the book's lock. 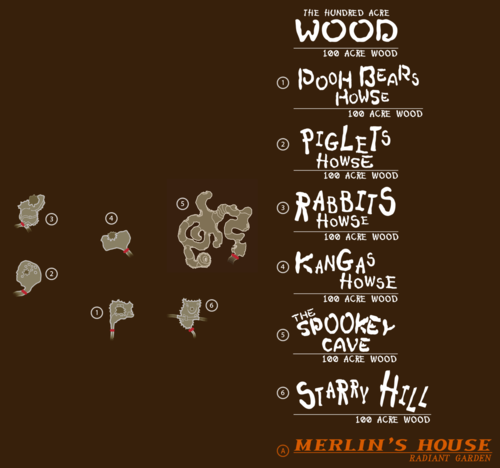 A map of the 100 Acre Wood. The open pages of the book are known as 100 Acre Wood (100エーカーの森, 100 Ēkā no Mori?, lit. "Forest of 100 Acres"). 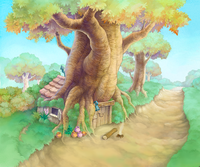 From this area, Sora can enter the individual areas contained within 100 Acre Wood's pages. One of the few pages initially left in the book contains the Wood: Meadow (草原, Sōgen?, lit. "Grassland"), where Sora meets Winnie the Pooh. It is a small meadow surrounded by trees, scattered with a few flowers and rocks, whose primary feature is a hollow, overturned log which Winnie the Pooh often uses as a seat. The other page contains Pooh's House (プーのいえ, Pū no Ie? ), where Sora meets the wise Owl. It is a humble cottage built into the roots of a large tree, standing alongside a meandering forest path. In the grass behind the cottage are five pots of honey which track Sora's progress in obtaining the Cheer ability; when Sora has completed the required objective in one of the five involved mini-games, the pot is filled with honey. Pooh keeps a sign reading "Mr. Sanders" above the door, as well as a bell and a note reading "RNIG ALSO",[sic] and has left a small cooking fire with a log to sit on directly below it. Through the door is Pooh's Room (プーのへや, Pū no Heya? ), a spartan room with a chair, a table, a bed, a window, a mirror, some clocks and paintings of honeypots, two cupboards filled with honeypots, and many honeypots laying about. The first Torn Page to be restored contains the Hunny Tree (ハチミツの木, Hachimitsu no Ki? ), where Sora and Pooh find Piglet. It is an immense English Oak tree on a small knoll, filled with cavities and beehives. The knoll also holds a small pond and another hollow log, where Piglet hides. The third Torn Page contains the Wood: Hill (丘, Oka?, lit. "Hill"), near the Meadow, where Sora rescues Eeyore.. It is a medium-sized bluff standing above a running brook, crossed by a wooden beam bridge. On top of the bluff is another large oak, from which hangs Pooh's swing, and across the brook is Eeyore's "house", a tiny lean-to made of sticks. The fourth Torn Page contains the Bouncing Spot (ティガーの遊び場, Tigā no Asobiba?, lit. "Tigger's Playground"), where Tigger and Roo spend their time. It is a clearing in the middle of the woods, filled with tree stumps and a seesaw. An immense honeypot sits on the center-most stump, and many Rare Nuts hang from the surrounding trees. The final Torn Page contains the Muddy Path (どろんこ道, Doronko Michi? ), a winding forest trail where each of Pooh's friends has gotten lost once again. The bottom-most portion is a small moody ravine underneath the trees, with a small hollow thicket of brush at its middle. At the end of a glen is a well from which very strong winds blow, adjacent to several burrows. Above the well is a hollow log crossing the sides of the ravine, and the trees hold a few beehives. There are several geraniums throughout the ravine, where Pooh can find butterflies to carry him around. In Kingdom Hearts Chain of Memories, the various areas are combined into one long room, and there is only one minigame: get Pooh to the exit while finding all of his lost friends. Each of Pooh's friends will give Sora a reward; the minigame is also the best place to collect Moogle Points. In Kingdom Hearts Re:Chain of Memories, the area is split up into multiple rooms along a path, along with multiple minigames. The first area is Pooh Bear's House which is the only room that does not contain a minigame, although Piglet is in the room and must be found. The next area is Rabbit's House, which contains Rabbit and the Veggie Panic minigame. 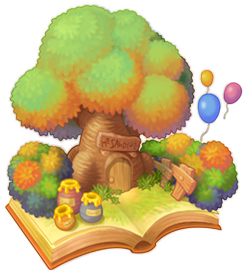 Hunny Tree contains Owl and the Balloon Glider minigame, while Tigger's Playground contains Tigger, Roo, the Tigger's Jump-a-Thon minigame, and the only treasure chest of this world, the Spellbinder Card. The Muddy Road contains Eeyore, as well as the Whirlwind Plunge and Bumble-Rumble minigames. Finally, the Fields contain a save point and the world exit. 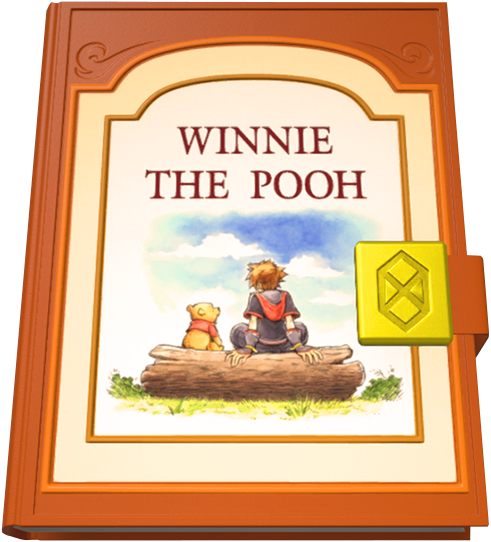 Kingdom Hearts II retains a few of the previous locations in the 100 Acre Wood, most notably Pooh Bear's House (｢プーの家｣のおはなし, "Pū no Ie" no Ohanashi?, lit. "The Story of Pooh's House") and Rabbit's House ( ｢ラビットの家｣のおはなし, Rabitto no Ie no Ohanashi?, lit. 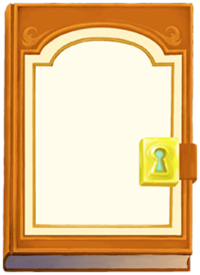 "The Story of Rabbit's House"), although the mini-games found in these locations have changed, and Rabbit's House is not available until the second Torn Page is found. In addition, Piglet's House (｢ピグレットの家｣のおはなし, "Piguretto no Ie" no Ohanashi?, lit. "The Story of Piglet's House") has been added as the first mini-game location to open up. Kanga's House (｢カンガの家｣のおはなし, "Kanga no Ie" no Ohanashi?, lit. "The Story of Kanga's House") opens up with the return of the third Torn Page, and The Spooky Cave (｢おばけ洞窟｣のおはなし, "Obake Dōkutsu" no Ohanashi?, lit. "The Story of The Haunted Cave") at the fourth. The final area, Starry Hill (｢星空の丘｣のおはなし, "Hoshizora no Oka" no Ohanashi?, lit. "The Story of The Starry-Skied Hill"), will open when all five pages have been found and completes the repairs on Pooh's poor, abused book which was ripped by the Heartless. The surface of the book, from which the other locations are accessed, is referred to as The Hundred Acre Wood (100エーカーの森, 100 Ēkā no Mori?, lit. "Forest of 100 Acres"). In Kingdom Hearts III, the world has been significantly scaled down compared to previous appearances. The only part of the world that can be accessed here is Rabbit's House (｢ラビットの家｣のおはなし｣, Rabitto no Ie no Ohanashi?, lit. "The Story of Rabbit's House"), where the entirety of the plot takes place, and where all three mini-games can be found. Like in Kingdom Hearts II, Sora can only explore Rabbit's garden, with the house itself not being explorable. Winnie the Pooh, Piglet, Tigger, Roo, Lumpy, and, of course, Rabbit all reside in this area. Rabbit, after almost being crushed by a pumpkin. When Merlin drops the 100 Acre Wood book while walking home, Terra picks it up and returns it to him, who says he has never seen it before. He leaves it in his house for Terra, and later invites Ventus and Aqua in to read it when they pass by. After it is returned, the three main characters can read it to unlock their hidden powers, visualized as the Honey Pot Board. Cid first gives the book to Sora to give to Merlin, who tells Sora that there is a world within the book. He mentions that Sora needs to collect Torn Pages throughout the worlds until he finds and seals the 100 Acre Wood's Keyhole. When Sora first goes into the book, he meets Winnie the Pooh, who is the only one left in the book. Along the way, he finds and makes friends with each of the 100 Acre Wood's inhabitants, with whom he plays a Christopher Robin-like role. 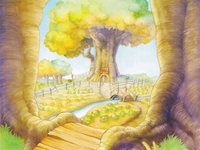 The 100 Acre Wood appears in Sora's second set of World Cards, and can be accessed on the seventh, eighth, ninth, or tenth floor of Castle Oblivion. When Sora enters the world, he finds Pooh all alone, and decides to go down the path with the teddy bear in order to find his lost friends. 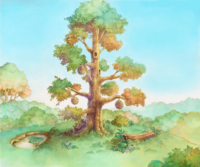 Upon going down the path, Sora and Pooh find Rabbit picking up cabbages, and get Owl's attention by having Pooh float high in the air with a bundle of balloons, brought back to the ground by Owl. Sora and Pooh find Roo in a hole after Pooh falls into it, and find Eeyore later down the path, whose tail is knocked down from a tree that Pooh, being chased by bees, runs in to. Tigger's attention is captured when Pooh is taught by Sora to bounce on tree stumps in a similar to formation to Tigger. Shortly afterwards, Sora and Pooh are bombarded by Rabbit's cabbages, which come rolling down the hill. Sora knocks the cabbages into a stack with the Keyblade, which causes Rabbit to appear. Rabbit explains that he tried rolling the cabbages down the path, since someone had broken the cart he had planned to use to bring them down. Coincidentally, it was Sora and Pooh who broke this cart. Sora and Pooh soon afterwards arrive at the end of the path, with all of Pooh's friends found. The two say their parting words, and Sora leaves to continue climbing to the top of Castle Oblivion. The book after it has been attacked by Heartless in Kingdom Hearts II. When Merlin moves to Hollow Bastion, he takes the book with him. When Sora returns, he excitedly enters the book to check up on his friends. While he is greeting Pooh, he is suddenly ejected from the book as the Heartless try to steal it. During the battle to recover the book, it is damaged. Upon return, Sora finds Pooh with severe amnesia, unable to remember him and all of his other friends. Sora then goes out to find Torn Pages which slowly restore Pooh's memory of his friends while continuing his quest to find Riku and King Mickey. Shortly after fully repairing the book, Sora admits that he has to leave again, but reassures Pooh that they will always be in each other's hearts. 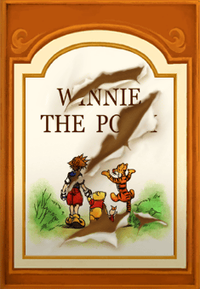 Once all five Torn Pages have been located, the book's cover is changed to a picture of Sora and Winnie the Pooh sitting on Starry Hill together. Absent but mentioned characters are Owl's cousin Alphonse and his uncle Albert. ↑ Although the individual characters first appeared in Winnie the Pooh and the Honey Tree (1966) and Winnie the Pooh and the Blustery Day (1968), the setting first appeared within the Disney animated canon in The Many Adventures of Winnie the Pooh, which collected these featurettes. ↑ Kingdom Hearts II, Owl: "Jagular...well, now. That reminds me of when dear cousin Alphonse—"
↑ Kingdom Hearts II, Owl: "After all, I must tell you of my Uncle Albert's adventures at sea."